Obtaining the correct weight of liquids can be an arduous task. Many different industries often need to perform this chore, some even on a daily basis. Industries measure an array of chemicals by their weight. Detergents, surfactants, and acids are some examples of chemical products that need consistent, accurate, a quick liquid measurements. Besides these harsher chemical materials, common household items such as cooking oils, motor vehicle windshield wiper fluid, and fruit juice are all substances that are also measured by their weight. The very nature of a liquid makes the process of obtaining an accurate weight somewhat unique. Liquids are unlike solid objects such as packages, which may be placed on platform scales, or animals which can be weighed on veterinarian scales. Liquids cannot be weighed in and of themselves. They must be placed in a container in order to be properly weighed and most often the container of choice is a drum. Arlyn Scales has created a scale for just this purpose of weighing liquids; it is appropriately named a drum scale. These drum scales are designed to precisely weigh the contents of industrial drums that contain a vast array of liquids. They are used by various industries around the world and are prized for being easy to operate and capable of producing accurate measurements. The industrial drum scale by Arlyn Scales comes in different platform sizes. 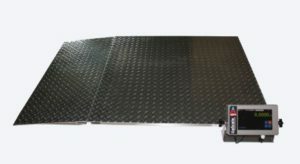 From the standard 20′ x 27′ to the 48′ x 48′ for larger totes and drum scales, these scales are sure to suit anyone’s needs. Whatever the platform size, Arlyn Scales includes a number of very important design elements. Each of their drums scales boasts a low profile platform that is less than 2 inches high from the floor. This design ensures that the drums can be manually rolled onto the platform. Alternatively, a drum cart can be employed to hoist the drums to the scale. The lower the height of the platform, the less effort it will take to maneuver the drums. In addition, the low platform requires only a short ramp, therefore decreasing the amount of space dedicated to the scale. Another feature is that it is a rail-less design, which allows for overhang of the load on all four sides. Because the weighing of liquids requires the use of a drum, the precise weight of the drum must be deducted from the total combined weight of both the liquid and drum. The precise weight of the drum is vital to accurate measurement of liquids. Arlyn Scales drum scales are capable of not only obtaining the correct weight of the drum, but they are able to then store the weight of the drum and even automatically subtract it from the gross weight. This feature eliminates the additional step of calculating the drum’s weight every time a measurement is taken. Instead, the actual net weight of the liquid or the gross weight can be displayed with just a touch of a button. The data collected from these scales can be used with printers or computers thanks to a serial RS-232 communication port or the more common USB. An Ethernet or Wi-Fi interface even allows the weight data to be directed to the Internet. With the optional datalogger, the weight can be written onto a Google Spreadsheet and monitored in real time anywhere there is Internet access. With a built-in converter, these weights are given in several units. Pounds, kilograms, ounces, and grams are all available units of measurements on these scales. Sometimes it is also necessary to know the volume of these liquids. Using other methods, such as a floating device in the drum can produce inaccurate measurements and are often difficult to read. When utilizing the drum scale, simple calculations that include density will translate the obtained weight into volume. To obtain these highly accurate measurements, Arlyn Scales created their drum scales so that they include not one, but four load sensors. To begin, just place the drum on the scale and the rest is magic. One sensor is placed in each of the corners of the platform. However, sensors are exposed to the potential of horizontal shock load damage when using a drum cart or manually rolling the drums onto the scale’s platform. This is very damaging to the load sensors. Therefore, the sensors must be rugged and durable enough to withstand such accidental abuse. Most scales are outfitted with steel or aluminum load sensors. That type of scale design is still vulnerable to such damage. High-end scales, such as the ones created by Arlyn Scales, use a heat-treated alloy of stainless steel for their sensors. These scales are better equipped to survive such accidental shock load. In addition, this design allows the scales to operate in environments where they may be exposed to harsh conditions, such as moisture or chemicals, which is common when weighing liquids. These scales can be outfitted and customized to your infrastructure needs with ease. Arlyn Scales offers upgrades including touch screen digital indicators, thermal printers, flow rate measurement programs, USB ports, time and date displays and many more depending on the work you do and your specific needs. Feel free to contact us via web if you have any questions.